A molecule that our body produces helps relaxes narrowed blood vessels, increasing oxygen and blood flow, which we call Catalyzing Oxygenation. This molecule is nitric oxide and it helps 50 trillion cells communicate with each other by transmitting signals throughout the body. There have been over 60,000 studies done on nitric oxide in the last 20 years and in 1998, The Nobel Prize for Medicine was given to three scientists that discovered the signaling role of nitric oxide. The problem is the body’s production of nitric oxide starts to decrease at age 40 and goes downhill from there. 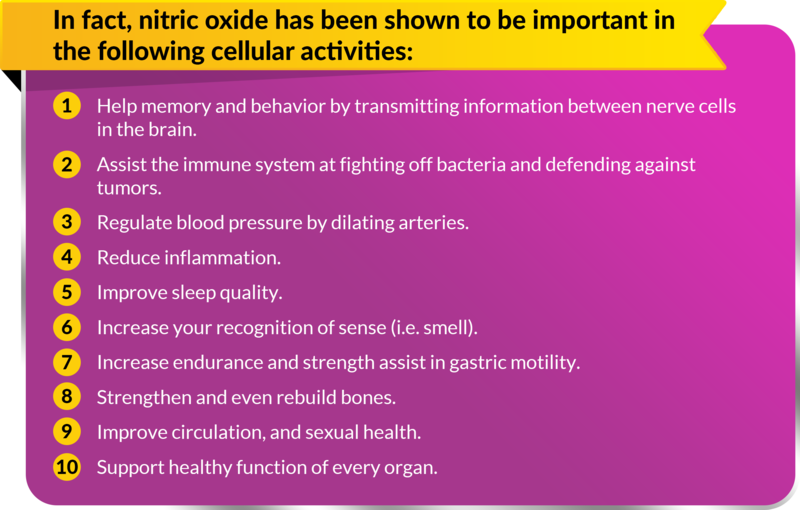 The body’s ability or inability to manufacture nitric oxide can be influenced by factors such as genetics, level of physical activity, toxin exposure and diet. In fact, excessive sugar consumption is linked to cardiovascular and metabolic health problems, and nitric oxide deficiency. The most common way to increase nitric oxide is through exercise. When you run or lift weights, your muscles need more oxygen which is supplied by the blood. As the heart pumps with more pressure to supply the muscles with blood, the lining in your arteries releases nitric oxide into the blood, which relaxes and widens the vessel wall, allowing for more blood to pass though. As we age, our blood vessels and nitric oxide system become less efficient due to free radical damage, inactivity, and poor diet, causing our veins and arteries to deteriorate. However, exercise is not an on-going option for many, and the alternative is to use a proprietary supplement that help the body naturally increase the production of nitric oxide, and therefore increase energy, vitality and overall wellness.